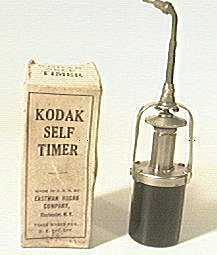 A precursor to the mechanical timers of later years, this device operates rather like a cycle pump in reverse. The central plunger is depressed into the cylinder where it is latched into position. When the latch is released the plunger is restored by a spring at a rate defined by a small valve which allows air back into the cylinder, thus operating the attached cable release after a short period of time. Prior to Kodak's introduction of the pre-loaded 135 film cassette with which we are all familiar today, individual manufacturers used their own designs, which were usually reloaded in the darkroom from bulk rolls. 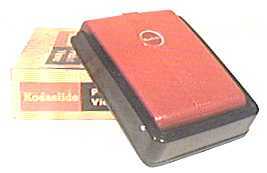 An example of a "pre-135" film cassette is shown here. Produced in Croydon, England, this device features adjustable end-float and backlash so that it could be set up to suit any camera, though it may need to be re-adjusted for a different model. 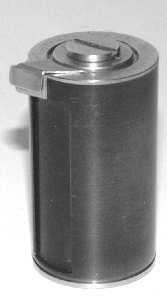 There is no felt light trap, instead there is a rotating metal blind, controlled by a spring clutch, which is opened and closed by manipulation of the film rewind knob. Many thanks to Henk in Australia who supplied me with a scan of the instructions, without which I would have never worked out how to operate the thing. 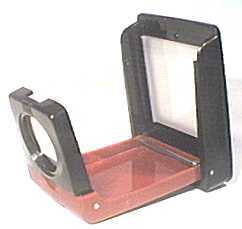 Made in England, a stylishly compact fold-up slide viewer.